It's been a while since I got seriously stuck in a book. You know when you can't put it down, desperate for a few spare minutes to keep reading.... I missed that feeling. I had been putting off reading 'The Fault in our stars' for ages. Jumping on the bandwagon. Everyone was reading it, obviously everyone liked it but for some reason it just didn't appeal to me but anyway one night I downloaded a free sample on my kindle and was hooked straight away. 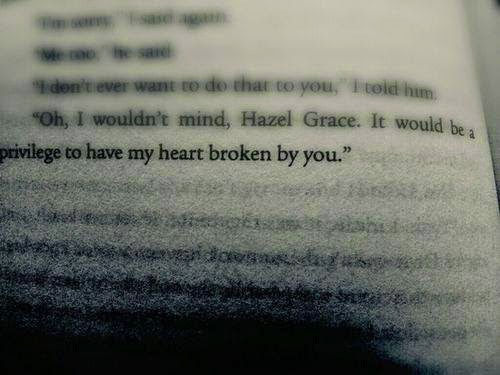 I loved the characters, both Hazel and Augustus. I loved how in love they were, remember when you were in love at that age and it's even more intense because of your teenagerness, where every tiny thing is a big deal, let alone falling in love. I just think it was amazingly written, I appreciated the writing, the storyline. It was perfect. I also love books that make you feel that huge emotion, I mean I was hysterically crying and it's good to do that sometimes, feel stuff, it reminds you that you're alive, makes you assess your own life, your own feelings. I can only ever dream of writing a book this good but it is inspiring, reading books like this and making you want to be a better writer. I love the conversations I've had with people about it and that's what I like best about books, it makes you part of a special little club of people who have been touched by someones words on paper. If you are one of the few people on the planet that hasn't read the book, my only advice, you will need a lot of tissues and no eye make-up! !